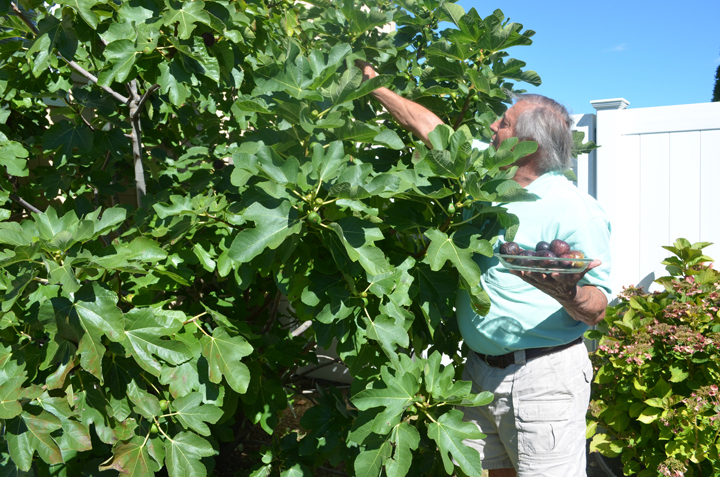 The "Fig Bonanza" that keeps on giving, my father's fig tree! My influence to make this tart was the upcoming visit of my dearest friends from Portland, Oregon. These folks love food and wine and our visits with each other whether out west or out east always revolve around the communal table. Andrew is a classically trained chef who did a one year apprenticeship with Alain Ducasse, at his flagship restaurant Le Louis XV in Monte Carlo, Monaco. I thought, "Wouldn't it be so cool to do my first french tart for my friends from Oregon, especially for Andrew. My friends arrived in New York City on the red eye with little to no sleep. I was so excited to tell Andrew I made a Fig Pistachio Frangipane Tart. I do not know about you but I have a really bad habit of bastardizing words in the English language and even more difficult time pronouncing some. My friends and family can vouch for this as well as the various word trends I end up creating. Within the first 5 minutes I said, "Andrew, I made my first ever French Tart!" He said, "What did you make?" I said, "Fig Pistachio Frangipane Tart?" He hesitated and was not certain exactly what I said and I know it had nothing to do with the lack of sleep. He said, "Sounds Italian!" I said, "No, it is French!" Andrew said, "Ohhhhh you mean "Frangipane!" Of course he pronounced it with the most perfect French accent (pronounced: FRAN-jup-payn, FRAWN-zhee-pan). I of course defaulted to my own Italian dialect whatever that may be. If you are as curious as I about what Frangipane is you can read it here. note: the history of Frangipane is traced back to the 16th-century Italian nobleman, Marquis Muzio Frangipani. So maybe my pronunciation was okay after all! Okay, on with this Tart. I knew I wanted to make a nut tart pastry and now (my new favorite word Franzipane) which typically is a ground almond cream filling. The recipe for this tart was influenced by, In the Sweet Kitchen, by Regan Daley. However my twist was a Pignoli nut crust (my italian heritage slipping in there) with a Pistachio Franzipane filling. Lightly toast the pignoli nuts and let cool completely. Combine the nuts and sugar in a food processor and quickly pulse until the nuts and sugar are finely ground but NOT nut butter! Add the flour and pulse once or twice until blended, then add the cold butter and pulse for 20 seconds or until the pieces of butter are the size of peas. Add the egg yolk and pulse for 5-7 seconds until mixture comes together. Press the crumble into a 10-11 inch tart tin with a removable bottom (or you can press the dough into 6 tartlette tins) Make sure the dough is evenly pressed and there are no bare patches. The shells can be frozen and well wrapped up to a month or you can move on to blind baking your nut crust. Prick the bottom of each chilled shell all over with a fork. Line the bottom with a piece of parchment paper slightly bigger than shell and fill it with pie weights or dried beans. Place the shell(s) on a baking sheet and place in center of oven and bake for 8-10 minutes for tiny shell(s), 12-15 minutes for small shell(s) and 15-18 minutes for large shell(s), (which is what I used) or until the edges of the pastry are dry and just beginning to color. Remove the liner and weights and return shell(s) to oven for another 5-10 minutes, depending on the size of your shell(s) and until the floor is dry not colored. Transfer to wire rack to completely cool before filling and baking. note: you can use almonds as well for the frangipane. Combine the pistachios and 1/3 cup sugar in a food processor and finely ground. Add the butter and pulse until smooth, scrape down sides as needed. Add egg and egg yolk and process until thoroughly incorporated, then add almond extract. Process for 45 seconds. Then sift half the flour over pistachio paste and pulse 3-4 times. Repeat with second half until flour is incorporated but do not over mix. note: frangipane can be used immediately or can be made up to 2 days in advance. Should be stored in airtight container in refrigerator. Needs to be brought to room temperature before proceeding with recipe. Gently warm the honey over low flame and brush a thin layer on the bottom of the cooled tart shell(s). Spread the frangipane evenly over the honey. Wash and dry the figs. Cut off the tiny nib at the top and cut lengthwise. Arrange the halves, cut-side up, in concentric circles over the frangipane. Having the stem-ends point toward the center helps them fit better. Sprinkle the entire surface of the tart with 2 tbsp of sugar and place on baking sheet. Bake for 50-60 minutes or until the frangipane is slightly puffed and golden in places and is firm to the touch in center of tart. Transfer the tart to wire rack and cool completely. In a small saucepan melt jelly with 1 tbsp of water to lightly coat the figs with the jelly glaze. should be a thin film only on the figs not coating the entire tart. Let cool for 5-10 minutes. Dust with some confectioners' sugar before serving (optional). "How can I capture this flavor for a cold winter day while the fig tree lies dormant?" So I dove right into the sweetness of this fruit and decided to jam away! 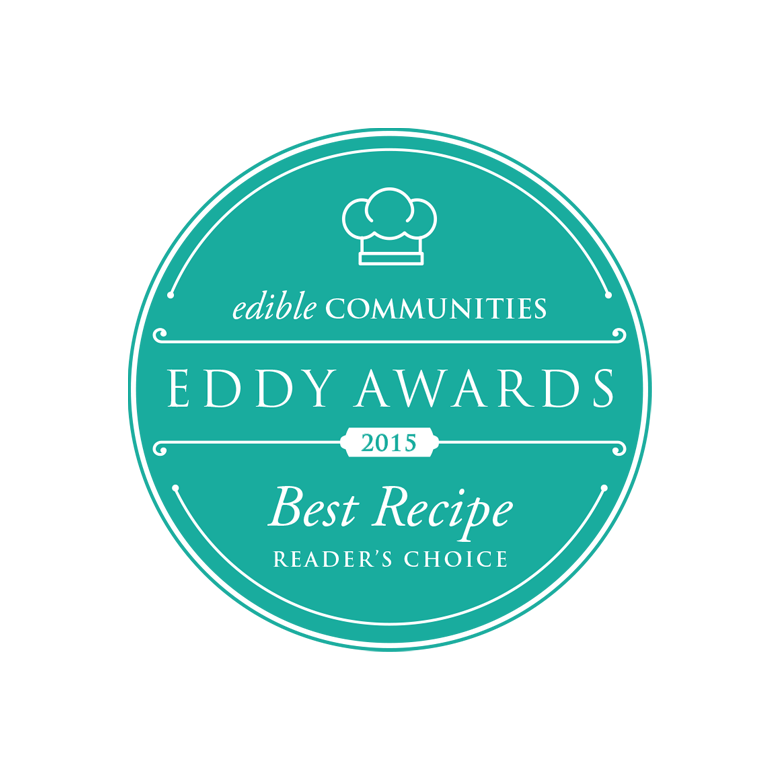 I am so happy I did, it is easy to do and the flavors are incredible. You can serve this up with some fresh ricotta on toast, a favorite cheese plate or right out of the jar. 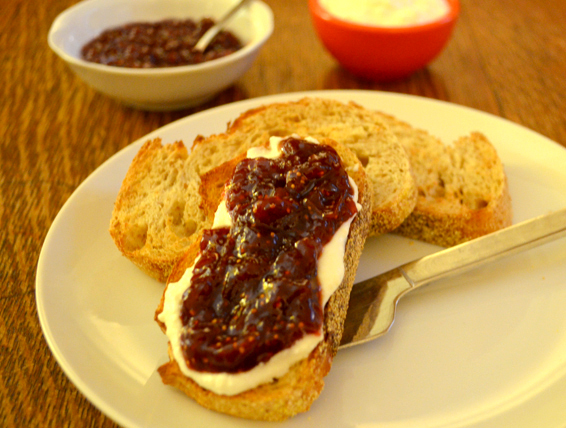 This jam is good with pretty much anything. Place all the ingredients into a large pot on the stove at medium heat. When the ingredients begin to boil lower the heat and have it simmer for 35 - 40 minutes or until the jam looks like an amber color. note: You should sterilize your jars if you would like to store the jam for up to a year. Makes about 2 cups. While I was making the jam the funniest thing happened. When I cook in my 400 sq ft apartment in NYC, I open the back window and have a fan in the front window to pull the air through the space to ventilate the apartment from feeling like an oven. 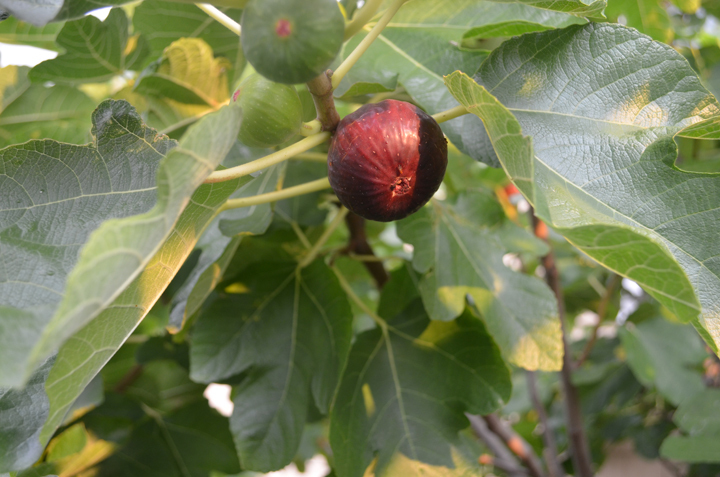 As the sweet smell of figs were being pulled outside the window two Honey Bees came flying into the apartment. They started to swarm my pot of jam and thankfully they were not interested in me and eventually I was able to shoe them out the window. I guess if the bees liked the smell of my jam then that is a good sign!